Each week, or at least once a month, clean your car's dashboard and doors with a damp cloth or the old standby, baby wipes. A weekly ar cleaning with kids is a natural - they do help gunk up the family ride, after all! Use a damp brush for vents and hard to reach spots. Then apply a vinyl cleaner and restorer product, 3M's leather and vinyl restorer. Start your car cleaning with kids by rinsing the loose dirt from the car with your hose. Kids of all ages love this part! Lift the windshield wipers and spray beneath. Don't forget - or let the kids forget - the undersides of the wheel wells and the hubcaps. Starting with the roof, wash 3-foot (or so) sections using your mitt or a rag dipped in soapy water. Rinse immediately. Use either a mild, home-made cleaner and as little soap as possible to minimize streaks (such as a squirt of dishwashing liquid in a bucket of warm water or one part white vinegar to two parts warm water) or your favorite commercial glass cleaner. Don't use ammonia-containing cleaners: They can damage the tint on the inside of your windows. Use either a sponge or a clean cotton cloth to do the washing and another clean cotton cloth to dry. Just make sure there aren't any traces of fabric softener or dryer sheet reside on the towel(s) as these can cause streaks on windows, too. Why make your job any more difficult than it already is? Finally, grab a section or two of yesterday's news, and we're ready to roll (up your sleeves and down the windows, that is). Let's begin by removing that annoying dirt line around the top of your car door window. Lower the window an inch or so. Clean the outside first, dipping your sponge in the bucket or spraying your cleaner of choice on the towel. wring any excess from your sponge then gently rub the window using a side-to-side motion, removing road grunge as you go. Sparkling clean car windows benefit from a group effort. Roll up the window, finish cleaning the bottom portion; wipe dry with the clean cotton towel. Move in a clockwise motion around the car cleaning the outside glass in a similar fashion. Be sure to get way down there in the crevices of the windshield. That's where the scary stuff settles. When clean, use the second towel to dry your surfaces. The piece de resistance? Crumble yesterday's news and polish the windows and windshield to a sparkling clean perfection - inside and out. Mirrors, too! To loosen gross gunk such as flicked-on tar, dip a scrub sponge in 1/4 cup of vinegar mixed with 1/2 teaspoon of linseed oil and rub it into the stubborn spot. Rinse the car thoroughly (the kids are probably really getting into this about now) to remove any suds hidden under the door handles and inside the rear-view mirrors. Dry the car immediately with chamois or rags. Really think twice about it before you wax your car. If you do it once, you'll get to do it over and over. That's because once you start waxing your car, you'll need to keep it up or your finish will begin to look dull. Wax only if you're really into watching water bead up or tormenting your argumentative teen. Otherwise, you're just adding more time to your weekly car-cleaning routine. Use a silicone-based polish for plastic bumpers. Spray the tire with a silicone product for a sleek, finished look. Don't wait till wash day to attack the dreaded tree sap. Wipe it off immediately with a damp sponge or rag before it has a chance to stain your car's exterior. It's important to spring clean your car just as you do your house. Give your winter-weary car an undercarriage wash each spring to remove road salt, sand, and anything else that might have hitched a ride there during the stormy winter months. 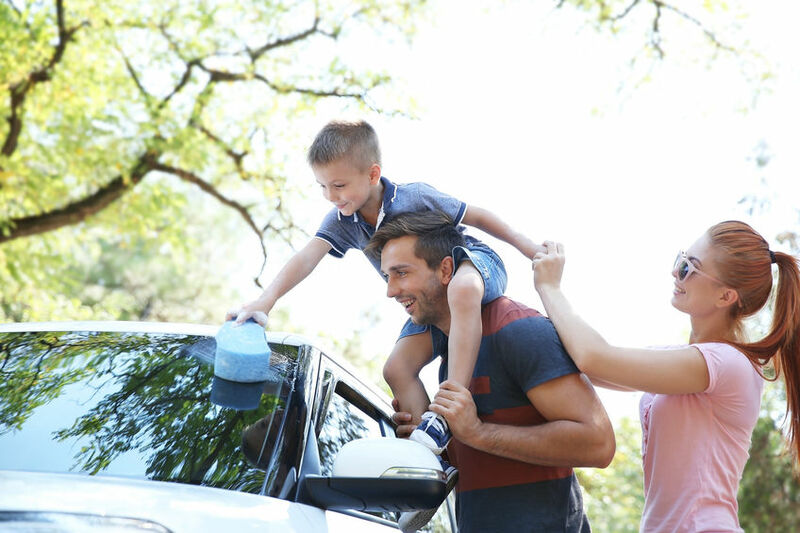 This list of car chores by age can help ensure car cleaning with kids is a success - and that everyone is able to adequately complete their assigned cleaning job! Wash the car's undercarriage each spring.